Frozen yogurt treats are now available for your dog to enjoy after a great day at play! These are premier dog treats exclusively at Dog Day Getaway and flavors include Bacon & Peanut Butter, Banana & Peanut Butter, and Pumpkin & Cinnamon. 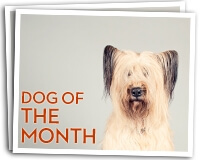 Say Hi to our September 2018 Dog of the Month, Logan. He is one handsome Husky and we couldn’t be more excited about him winning the September DOTM! Let’s find out more!